Due to courier surcharges on long parcels, to have the Large Springer aerial is an extra £3... sorry! The TTi TCB-900 is a very well built, front-facing speaker, multi-standard CB which can operate on either 12v or 24v without user adjustment. Features a large LCD display and backlighting of the controls which you can choose to be either blue red or purple. 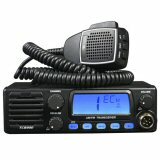 The TTI TCB-900 has a very high quality feel to it, both in physical terms and with the features it has - it feels and behaves more like a professional business radio than a CB. Large backlit LCD display shows channel number, frequency, band and legends for all functions. Tri-colour backlighting - buttons also have back lighting. Backlighting can also be dimmed in 3 stages - high, low or off. Quality microphone with up/down channel change and Lock buttons - lock button can also activate a mute function, silencing the radio, handy if you need to speak to someone out of the window or receive a phone call - allowing you to return volume to where it was before, without having to mess around with the volume and squelch again. Due to surcharges for long parcels imposed by our carriers, the large Springer is an extra £3 - sorry! 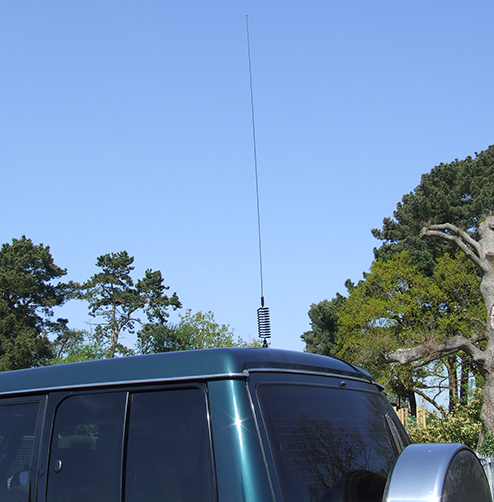 Strong mount, ideal for the back of Land Rovers and others. For vehicles with conventional "lipped" gutters. Suitable for Round or Square bars, vertical or horizontal. Smaller bar mount for roofracks, bars and many other places. Ideal for steel roofs, bonnets etc. Rollcages upto 2.5 inch diameter. Don't fancy a Springer? We offer alternatives and you can still take advantage of our Package Deal savings!